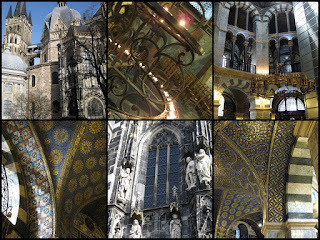 Yesterday we visited the Dom in Aachen( this link allows you to see around the whole Palantine Chapel) which has rich history going back to the time of Charlemagne. The cathedral has been classified Unesco world heritage and is worth a visit.The Palanatine Chapel is octagonal and in the only one of its kind in Northern Europe. it is adorned by rich mosaics which were said to have been inspired by those of Ravenna as is the structure of the Chapel. The chandelier in the middle of the Chapel was a crusader conquest of Barbarossa and was carried back to Germany to adorn the Chapel. the outcome. i had loads of cream wool so used it as my base and of course less of the other colours. I recommend her book Felting Fashion which is available through her website.This particular piece is about 120 cm long and 30 cm wide and the texture is quite soft. the piece below is much smaller about 30 cm wide by 50 cm long- so I might joint it into the other piece so I can wear it as a wrap. I need something warm with all this continuing snow! The last photo is of a hat- I am not sure I shall wear it but it was interesting to make just to learn what not to do! And my next on-line linocutting class will commence on 8 March- see one of my previous posts with some of the efforts of past and present participants. If you are interested please email me.The cost is 40 euros ( or $54 US) for three fortnightly lessons with lots of different exercises to extend your skills and design ideas. This is an old stone bridge near le Triadou. We drive past it quite often but it was quite a scamper to actually get a photo as there is quite a lot of traffic along the road it sits beside- so pulling up on the road is not an option. 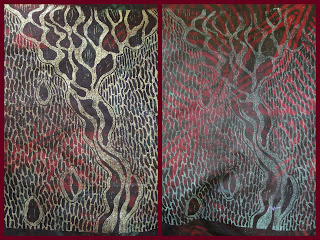 The second image is of my boabab tree finally all stitched. The stitching on the lino-cut printed image really does create a lot more texture. I now wish i had printed it on a different coloured fabric- oh well when I go back to Le triadou. At the moment we are in England staying with my friend Sandy. Taught a workshop yesterday which was a fun relaxed day- we were only six but it was like we had known each other for the longest time ( one or two I had known through various internet connections )- so a very pleasant day. We are looking around at what options we can find to live here - anyone have a spare 2 bedroom flat or house they want to rent out at a reasonable price?? No Stitching to show you unfortunately- I am having problems with the tension on the Pfaff here- I have tried lots of different things, but it keeps jumping out of tension so I am back to hand stitching.I actually suspect there may be a bur in the bobbin case. However i did want to share some of my work that is in a new textile magazine produced in Australia . You can see more information on Deborah Seagert's blog. Deborah has been the owner and editor of Downunder Quilts for a number of years and it is great to see the magazine venturing into textile arts. I wrote two articles for the magazine one on linocutprinting and another on working with lutradur( you can still purchase the Lovely Lutradur cd from me).It is a good discipline writing for magazines because you have to be succinct,informative and hopefully inspiring. I will be teaching anothe ron-line line cut course starting in early March so if you are interested email me.The cost is 40 euros for three fortnightly lessons - there are lots of exercises to practice and improve your linocutting and linoblock designing skills in each lesson . You can see some recent work by students on Linda Robertus' blog, Sarah Smiths' blog, Robbie Payne's blog,Linda Bilsborrow's blog,Clare Wasserman's blog,Wietske Kluck's blog, Sally's blog ( I think she got the bug bad! ), Magpie's artworks et al. I went for a drive last Sunday and came across some lovely little vignettes- first the lovely terracotta rooves in a small medieval village called Laroque- it's right on the river Herault and I imagine it to be choc a block full of tourists in summer. I couldn't help but notice the little discordance though- the ugly tin roof amidst all those lovely tterracotta tiles and old stones, and yes the ugly power lines as well. The second image is of a little twelfth century chapel on quite an isolated road- one wonders what poor folk worshipped there, and what one must have done in rome to be sent to such an isolated place. It looked as if it probaly had a small abbey and enclosed garden once upon a time, now a barely discernable ruin- and the sky was really that blue- no filters or anything- just very cold and clear! Don't forget i shall be in England next week and I will be giving a workshop in Keddington near Cambridge on the saturday- we will be working with lutradur and stitching. it is defintiely going ahead so if you are interested contact Sandy via her blog.The cost is 40 pounds including materials. I will be in England the week of the 16th of february to the 24th of February. I am staying with my friend Sandy and we have organised a workshop on Saturday the 20th of February in the Village where Sandy lives ( not far from Haverhill, Suffolk). If you are interested contact either Sandy ro me. We will be doing Transfer Printing on Lutradur and Stitching. Transfer Printing is a method of getting permanent colour onto synthetic materials such as lutradur (a polyester non-woven fibre), polyester and polyester organza. The process allows you to get three prints so that a series can be created. We also explore methods of melting back and free machine stitching to embellish your printed fabric. Using Polyester fabrics such as organza allows you to build layers and play with transparency and overlays and still create your own distinctive fabrics and pieces. Price will be £40 including materials. A supply list will be provided on sign up. The two photos are of the linocuts which i have hadn stitched. I particularly like the red one as the gold textile paint shines through the red stitching which gives a really nice effect. I must admit i liked the lino-cuts as stand alone ( see my previous post) and I really wondered what on earth stitching would add to the printed image.But i am pleased with how the stitching transformed the linocut. I have to stitch the edges and then they will be finished! Another linocut- this time with an idea that i want to explore for Southern Lands. I can see hand stitching on these- but which to chose- the golden one or the more subtle one? Possibly the latter as it lends itself more to stitching.As you can probably tell I am a bit besotted by linocutting at the moment and have set myself the goal to try and make one a week- all of the same size so they can be bound together in book form.I also want to see whether I can develop something thematically in this format ( in the past I have made a linocut in response to a need for some form of pattern or illustration in my work not as a stand alone) and as I have a tendency to do some research doing one a week allows me to explore and create a vocabulary as i go along. And those of you waiting to hear more about the KISS project- it is coming! And just a reminder- there are still afew places for the workshops I am teaching at Essen for the Textile Event there called Colours of Africa. The classes will be a bit in the nature of a mastercalss if you enroll for all three days 13-15 April as you will be making all your own fabric with which you will work on the last day.